My prayers on this auspicious Friday for Tan Sri Abu Kassim Mohamed, 55, the Malaysian Anti-Corruption Commission boss. I just learnt this morning from blogger Seademon's Living on the Edge about his troubled back and the risky operation that he'll be facing. 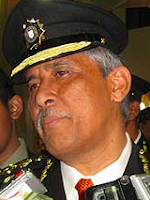 In his posting, Seademon, the son of the longest-serving Inspector-General of Police, did not mention "the good Tan Sri" by name but I checked with my source, who confirmed that it is Abu Kassim. My source ask me to keep it quiet but I said the story was out there already and I just needed a confirmation. If I'm beaching the Tan Sri's privacy with this posting, please accept my apologies. But I really can't stand those hypocrites politicizing his sick leave and cooking up all kinds of nastiness so that the PDRM and the MACC can be at loggerheads, which should satisfy their petty agenda. Please, people, including you #sokongSPRM advocates, make doa for him to get well soonest so that he can continue to fight for all of us as he's been doing all this while in case you hadn't noticed. Semoga segalanya dipermudahkan & berjalan dgn lancar. DAP condemned and spat at MACC on Teoh Beng Hock's case but are now supporting and "protecting" MACC from investigation by police on leakage of documents. The truth on Teoh Beng Hock's must have irritated and exposed DAP so much and now will it not be right to say that the truth on the leakages of documents will exposed the involvement of DAP again. If not, why the sudden change of support from hate to love? Shameless dirty politicking at it's highest order. No, you are not beaching his privacy - you are just bitching, and by doing so, you are breaching his privacy. I have read the latest post on SeaDemon's blog. It is surprising that he has fingered an unidentified businessman as having arranged the meeting between HRH Sultan of Johor and Tan Sri Muhyiddin. Of course, given SeaDemon's impeccable and unimpeachable sources, this claim could very well be true. 1. Who is this businessman who has the "clout" to be able to arrange such a meeting? 2. Did this businessman arrange for the meeting out of his own initiative, or was he asked to do? If the latter, at whose request? 4. Either of the 2 parties at the meeting could have refused to participate. They went and did so. Why? 5. There was also a posed photo that showed the 2 participants in the meeting, along with their respective spouses and the Johor Mentri Besar. Why give publicity to the meeting by agreeing to have a photograph taken? Of course, there is another possibility that SeaDemon has been way off base in his speculations because there are all sorts of criss-crossing motives and agendas. Could much of it be diversionary "smoke" to focus attention elsewhere than on the central issue of a large-scale movement of funds as has been reported elsewhere? Because one of the central tenets of Psywar 101 is to create confusion and doubt by raising all manner of extraneous issues, backed by "impeccable and unimpeachable" sources. What a coincident , anyway ,wish him well and back on his foots . Those who support Jibby for RM2.6 bil donation deposited into his personal account are not hypocrites... yes? Even still supporting such an untrustworthy individu with any cheap justifications are not hypocrites....no? Doa also for the former AG who was sacked for health reasons....still sick...no? you are telling lies downright... as his relative, i know what actually happens to him..
why you people get info from dodgy sources? and that source is the son of an ex-IGP? so now if Nedim son of Nazri open up the hole on his face, people now must believe him? Truth is, Abu Kassim himself never confirmed this story. a lot of people will have a pie on their faces. just like how some justified that AG resigned because he is ill when the AG himself did not know that he has tendered any resignation. media now has no more ethics. GET THE NEWS FROM THE REAL SOURCE PLEASE. So Rocky why are you worshiping the satan. Timb pengarah??? Ap mcm?? Dr luar ngr pun timb peng blh bunyi pertahankan ank buah dia. Cerita sakti ap plak rocky nk tulis psl timb pengrah sprm?? Haha! Datuk, what caring readers you have! They even check your spelling!!! Najib tak jatuh lagi sebab awak sokong dia. Power sebenarnya Rocky Bru ni. Do what you must. Personally I don't think Najib should be the PM regardless of 1mdb. He is just not smart enough to run a country. Thank you very much to Dato Marina Mahathir for her show of support to the SPRM. Memang boleh dipanggil a Towering Malay! Hi, Rocky, Tan Sri Abu Kassim is a senior govt. official. In that sense he is a public servant, so not sure if keeping his sick leave a secret was wise or made sense even if intruding his privacy. I think it is about time lah Rocky for you to go for the Maharaja Lawak Mega audition...kelakar lah. One thing for sure Najib will resort to all kind of reasons to justify his personal interest. Now he is claiming it is for UMNO pulak. So let he fall together with UMNO, dont fall alone. He js bigger than UMNO. Yes, Tan Sri get well soon and be ready to be transferred or 'promoted' out of MACC. This is the only scenario that Najib has not thought of it yet but it will happen when you out of the hospital. Many of the recent unfortunate victims' disappearances. transfers, retirements, intimidations and also for many other make up reasons. Dn't despair yet the people are not blind or deaf they all can clearly see what is happening and it is only the actions of a very very desperate man, just like a drowning man who will cling on even to a straw hoping to stay afloat. Najib please remembers you still have a private jet waiting for you and the botok filled fat Rosmah to be jetted away to Timbuktu to spend your twilight years. Even the pugnacious half breed Mahathir these days are very 'quite' on the whole affairs. Why I winder ? Senile or demansia and surely it is for not lack of ideas or reasons.It is for sure it is not for fear of spending his last days in prison where he had sent many people to by him, after all he would be considered too old to be sent to even by a moron. Finally Najib you can keep on with all the tricks you are trying but the people may have a short memory but blame your latest actions on your mentor Mahathir, he too pulled all the same stunts when he was the PM ! Saya pun menyokong SPRM yang bebas melakukan kerja nya - without fear or favour. The establishment of SPRM is flawed in that it is supposed to report to a higher executive power. The one last momentous question is that Najib must provide meticulously how and where the 2.6 billion ringgit was spent. And also if any of the money however small or large it is was left ? May be only a fraction of the 2.6 billion ringgits on the election that only the minority's vote. Also another very important question is did the EC got any of the 2.6 billions for the gerrymandering and despite that Najib only got the votes of the minority ? Finally what is happening to the pugnacious, repugnant and half breed Mahathir, your pay master, these days ? Surely he is not afraid of being arrested by his police besides he is too old to spend his twilight years in jail. Tun M just commented on 1MDB. Will the cops be interviewing him soon?